This Wednesday, July 11th is 7-Eleven’s birthday! 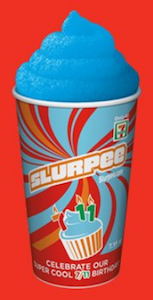 To celebrate, participating stores are offering a FREE Slurpee. I wish we had a 7-Eleven nearby…I love their Slurpees! That blue raspberry Slurpee pictured above looks pretty good to me. What’s your favorite flavor? Oh hopefully they will have some coke flavored slurpee left when I get there! I like the way it just melts into coke – the other ones are too sweet for me and when it starts to melt I don’t really care for the syrup.